The key to any artist’s practice has always been a network of publicly funded, as well as commercial exhibition spaces and support organisations. One that has lasted for many years now is Megalo Print Studio over in Kingston. I spent about six years as one of Megalo’s coordinators back in the second half of the 1980s. The organisation has come a long way since then and there are many stories about its past. Some good, some amazing and several best left in the bottom drawer. 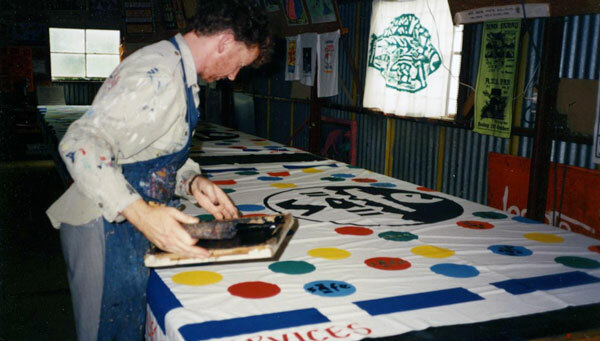 The Megalo that I knew was the screenprint access arts workshop then based in a long tin shed on the side of Ainslie Village. By today’s standards, it was primitive especially when it was freezing weather. It was just as cold inside. 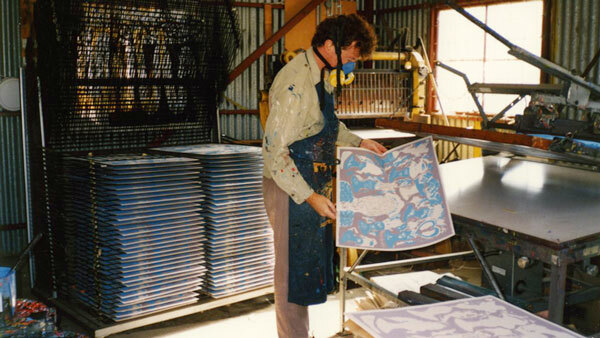 The pictures below are of Megalo around 1990 – and yes that’s me in the infamous tin shed. As for health and safety– that was something we talked about but had little resources to do much about. I think that given all the fumes I used to surround myself with, I am lucky to be alive today (maybe I should not have said that!). When I was employed to be the workshop/creative coordinator, the first task was to work with the brilliant and dedicated chair, Julian Webb, and the hard working Angelique Oltvolgyi (Admin Coordinator) to get the organisation back on track and regain the blessing of the funding bodies. It was an exercise of asking them to forgive the administrative sins of the past and have faith in the new management. They did (just) and Megalo survived. Megalo’s history from that point was varied as it grew out of those tin sheds and moved on (I left in 1991) to premises in Hackett and then to Watson. The Megalo we know today is actually an amalgamation of the screenprint workshop and the former Studio One that was in the former Kingston Art Space. I recently visited the studios and gallery in Kingston and was impressed by the facilities. They are great and may be even better than the workshops at the art school I attended so many years ago. I have to say that the present management of Megalo is to be congratulated. The ACT Government is also to be applauded for their on-going support for these magnificent studio facilities. Megalo today is very busy, with a range of programs and its on-going work to support artists and the community members with access to printmaking facilities. 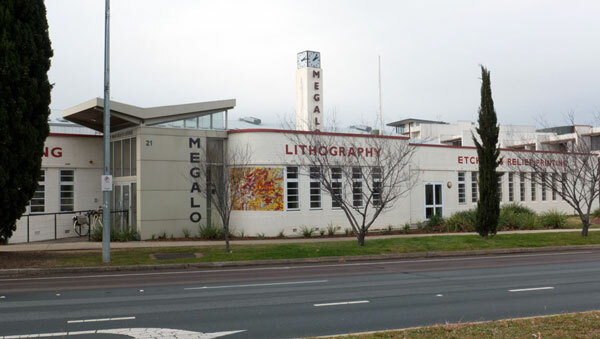 I have to agree with their own words that Megalo, “is the only open access studio in Australia with a comprehensive suite of printmaking facilities in screen printing on fabric, screen printing on fabric, lithography, relief and etching”. It’s brilliant! The day I visited the place was buzzing with people. There were groups and individuals hard at work creating all manner of prints – as well as doing all that extra stuff of cleaning up afterwards and preparing screens and other materials ready for print runs. It was also good to see that wonderful long fabric table again – that remains a testament to several people we employed up at Ainslie who took the initiative to build it from scratch. It was then and remains an invaluable resource that has been used by many artists over the subsequent years. The stories of how that table was moved from venue to venue are amazing. That it survived all of that and more is absolutely fantastic. The whole area around Megalo is soon to be subject to development as the Kingston Arts Precinct. Of course, as with all such developments, there will be apartments and other commercial stuff within the precinct. I would suggest that Megalo as it is today, is poised for another era of growth as a key art facility within this new precinct. Given the battles we used to undergo to survive back in the late eighties, it was wonderful to be shown through today’s facilities and to appreciate what a great jobs has been done by so many over the years to bring Megalo into being what it is in 2016. Well done all of you. I recommend you look at this facebook video – ‘A Day in the Life of Megalo‘.